Just a normal night. Fresh from the gym, stripping off the sweaty, sticky clothes… reaching for the trash and having your head intercepted by the corner of the windowsill resulting in blood, a gash, and emotional, blunt trauma. As I stood there looking at the clean cut standing open on my head, I really wasn’t sure what to do. So, I did what most people would. I texted my husband, “Need to get stitches in my head. Driving myself to urgent care.” He was in the restaurant kitchen, so I wasn’t going to interrupt a surely busy service with my little wound. He called me immediately demanding to know what happened. I was a little shaky and scared at that point, so he ordered me to call my mom and absolutely not drive myself. So I did. And Dr. Mom came to the rescue. Now, three weeks into my new job I’m walking around with bandages on my face, and only about four people know me well enough to either make fun of me or ask if I’m okay. Preheat oven to 375 degrees. In a bowl, cream butter-flavored Crisco (I promise this is the ultimate secret to fluffy cookies that are crisp outside and gooey inside) and both sugars. Add eggs and vanilla, stir until smooth. Add dry ingredients (salt, baking powder and flour). 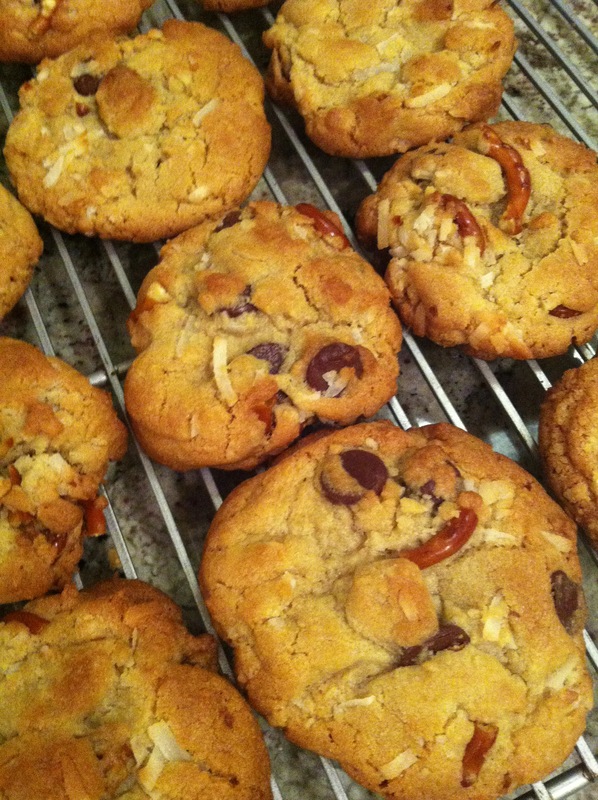 Stir in chocolate chips, coconut and pretzel pieces… adjust amounts to preferred proportions. I liked roughly equally proportions, but favored the chocolate a little more heavily.